Using the best products The Insulation Guru will blow in the recommended R-value to better insulate your attic. Taking care to keep it clean and out of the soffit area as well as drip pans and walkways. With a complete weatherization of the subfloor prior to weatherization, The Insulation Guru seals the openings in the subfloor prior to installation of the several options of insulation that can be installed. We will custom design a plan for your needs. Installed to energy star standards. For new construction and retro hotwalls, The Insulation Guru will install the insulation cut to fit for all residential insulation projects. White vinyl backed or one of our radiant barrier products. The Insulation Guru will install garage door insulation, ventilate, insulate and install a radiant barrier with all the options that your home gets. From metal baffles for vaulted ceilings to attic access insulation. The Insulation Guru offers several types and options of insulation when the need arises. Each attic has its own personality. From drill and fill to quietzone®. The Insulation Guru has many options to help keep your home insulated from the outside noise as well as room to room. Attic hotwalls are usually overlooked. We find hundreds of hot walls that are not even insulated. That leads to heat transfer into the house. 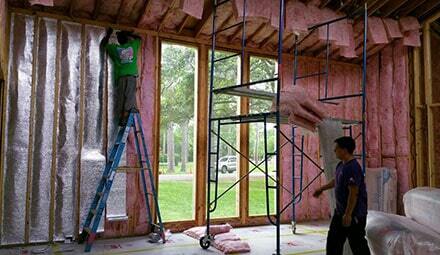 The Insulation Guru will weatherize and then install the insulation to energy star standards. Residential insulation works. Call us. 713-228-4878. Pipes running through the attic or exposed on the side of the house. The Insulation Guru will make sure that pipes stay at a temperature that will maximize the efficiency all year long. When install in accordance with manufacturer’s recommendations, Air Vent products should comply with the nationally recognized model codes, including those written by SBCCI, BOCA and ICBO . Also upon the initial walk through and overall inspection of the attic we can better fit a plan. From continuous to individual soffits, we do it all. Lifetime warranties with different CFM’s for smaller and larger houses. We install the fans to last. Residential ventilation. Basic and customer custom designs for perfect air ventilation. Installed by the best. Let the ridge of your house get rid of the hot air. The Insulation Guru knows ventilation. When that hard to reach area can only take an air hawk, we do it all. We even install the right ridge vent for the right County. There are companies out there that don’t realize that the same air hawk in Harris County would fail in Galveston. Mother Nature will make it spin to pull the hotter air out of your attic. 12” and 14” Turbines work. Mechanical air movement is another way to pull the hot air out. One of the many reasons we weatherize the floor of the attic and install an attic tent. You want the soffits to breathe, not your conditioned area. Important to keep the air flow and movement in the attic from soffit to ridge. We even have metal baffles as well as baffles that can span 20-30 feet. We offer several types of sealers as well as weatherization kits to better seal out the unwanted outside elements. Most older homes have duct chase areas that are open to the center sections of the house. These areas usually have open sheetrock walls that let heat penetrate into the air conditioned space. Unfortunately, most insulation companies over look these areas. The Insulation Guru makes sure that they are taken care of. Just as we add custom raised decking, install soffit vents and solar fans, we take the time to address all the issues that may contribute to the overall energy efficiency and energy conservation of the home. We seal it just like a new energy star home. Residential weatherization is important and is necessary. Call Insulation Guru today and start saving. 713-228-4878. Metal buildings can get super hot. The Insulation Guru installs reinforced vinyl in black and white. We can even custom design your company logo (In vinyl). With a variance of R-values we install with the conventional grid wire system and also with clips that can match any color. When installed to energy star standards batt insulation can cool down almost any structure. Fact that vinyl, batt, radiant barrier and other insulations cools down metal buildings, restaurants, offices and other businesses actually increases employee productivity, makes it a healthier environment and helps lower utility bills. The Insulation Guru is a certified Uniflex white insulated roof installer. There are companies out there that can paint your roof white but when you do the base coat as well as apply fabric to the screws and seams your top coat (WHITE) will last the test of time. The savings for white roofs far outweigh that of a conventional roof. Commercial Insulation works. Used for pipes, shipping containers, ice cream trucks, fleet vehicles, attics, converted office units and just about any substrate. Ceramic insulation is fast becoming a widely used insulated product because of its clean and awesome thermal makeup. Different R-values with different strengths and applications. Foam board is a widely used material in the commercial industry. The Insulation Guru will install the right insulation for the right project. FSK foil faced is another insulation product that when the plans call for it, we will provide. From white and black vinyl to radiant barrier products, the insulation guru can insulate, ventilate and weatherize any size structure. Quietzone®, foam board, drill and fill, curtain over structure. There are some unique ways to insulate and make it happen. Let us show you how we can help. From Phenolic to ceramic The Insulation Guru can take care of your pipes. Commercial insulation works. Call the Insulation Guru today and start saving and feeling better. 713-228-4878. There are so many ways to mechanically ventilate a structure. We can walk you through it to help lower the temperature as well as bring in fresh air to help with employee productivity. Tap the suns energy for all the right reasons and let it help remove the same heat it produces. The solar fans we use comes with a bumper to bumper lifetime warranty and will be professionally installed. Commercial ventilation is important to almost any structure. Employee productivity goes up when the heat is not right on top of everyone. 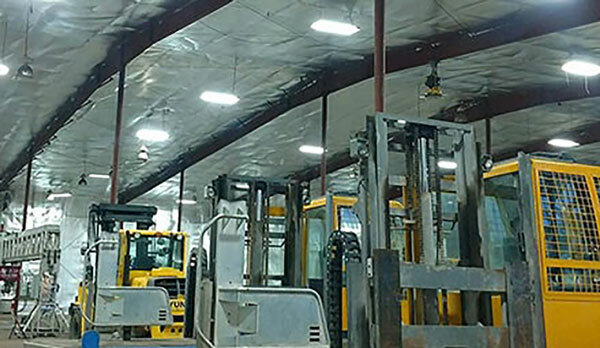 Cooling off the warehouses coupled with a good radiant barrier and insulation is the best way to save on utility bills if it is a conditioned area and a good way to keep production going. With multi-pitches with and without shutters. The Insulation Guru will install on your metal building, office, stand alone or whatever the structure is, shingle, flat roof, side to side or any other substrate. There are several options from low profile, solar, passive fans. Complete MBI ridge vents, soffit area vents, power base fans. With many sizes, colors and options, the Insulation Guru can make it happen. Call us today for a no hassle energy efficiency evaluation. 713-228-4878. Insulation Guru. Making it happen. Commercial ventilation. It is important to have an energy efficient, safe, clean and healthy working environment. Sealing of penetrations makes it happen. Stopping unwanted dust and other objects as well as helping with the thermal and sound, The Insulation Guru will do the best of the best when sealing. Commercial weatherization works. Adding insulation, radiant barrier, commercial weatherization and ventilation is important. You can increase productivity, have a healthier working environment and know that your place of business is a safe and healthy place to work in. Call today for your commercial weatherization, insulation, radiant barrier, weatherization and ventilation needs. Using technology from Bitum Texas that is widely used around the world, The Insulation Guru can take care of any part of the structure at any phase of the job. We work with reflective insulation as well as conventional and ceramic insulation. Insulation Guru can do it all. We take pride in our work and make sure we cover all the basis. Windows and Doors, walls and ceilings, floors and attic areas. All covered with a multiple level of commercial weatherization solutions. Insulation Guru also applies white roofs, complete solutions for all commercial weatherization, radiant barriers, reflective insulation applications, ventilation systems for small and large structures, metal buildings, office complexes, multi level and custom structures. Call the Insulation Guru and make the positive changes that will male your work place more energy efficient and effective. Insulation Guru. Making it happen. Houston and surrounding counties. Texas, Louisiana and neighboring States. 713-228-4878. Your geographic location has a lot to do with the amount of insulation your home needs to run efficiently. The chart below offers a look at Houston and surrounding cities which rank very high on the recommended insulation levels (Zones 2 and 3). Being closer to the equator simply means more direct sunlight and increased temperatures. The Insulation Guru must take this fact into consideration when recommending insulation solutions for your home’s specific needs. There are also factors such as previous depth of the insulation. Recommended insulation levels are important for so many reasons. At insulation Guru, we follow the map as well as the customers request. Insulation Guru uses L-77 which is a cleaner, less itchy to install insulation. All pictures on our website are Insulation Guru pictures. Nothing cropped. Insulation Guru. 713-228-4878. Call today. Or visit. www.facebook.com/insulationguru we are also on google+ insulation, radiant barrier, weatherization and ventilation.